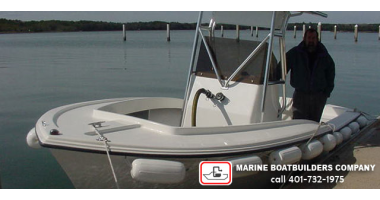 Marine Boatbuilders Company specializes in designing and manufacturing custom made Pump Kleen® pumpout boats. Our 19 foot pumpout boats are built for safety, simplicity and stability. 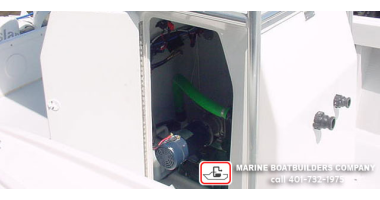 Our unique PUMP KLEEN® System offers many benefits and our boats are not made with wood, not in the hull, not in the deck and not in the transom. Our Pumpout Boat hull bottom is concave not convex like most hulls. This allows for maximum stability, and ease of handling. Our pumpout boat because of its design will not yaw in a following sea. The hull is constructed with a combination of hand laid woven, roving, and gun roving. All fiberglass is "E" glass and the resin is thermo set polyester. The gelcoat is ISO NPG thermo set gelcoat, normally 1.5" thick. 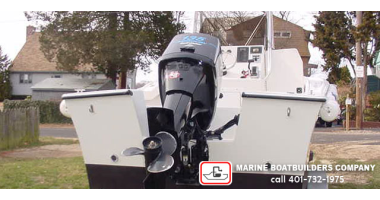 Our pumpout boat has a 10-degree dead rise at the stern, which allow the boat to plane quickly. The hull transom is a composite laminate 1.5" thick, a total of 3" thick. There is no wood in the transom. Our stringer system is a U channel which is a state of the art fiberglass system. There is no wood in our stringer system. The pumpout boat deck is constructed of a combination of hand laid woven, roving, and gun roving. Fiberglass "E" glass applied and the resin is thermostat gelcoat (white). The deck is finished with non-skid on horizontal surfaces. Our deck is self-bailing at all times; weather containment is full or empty. There is NO WOOD in our deck or floor. The floor is composet fiberglass. The deck has seven, cleats, two chalks and running lights. The bow which contains one, cleat, two chalks, and running lights are all stainless pop ups. Only storm and blister resistant gelcoats are used to form the skin of each Pumpout Boat, a wide variety of colors is available. White is our standard color included in the quote price; other color choices would be extra cost. A built in 300 gallon fiberglass holding tank below the water line, is a standard feature on our 20’ Pumpout Boat. The containment cell has five layers of fiberglass that include three layers of 18 oz. Cloth. Our containment cell has three baffles. The tank is equipped with an alarm that sounds when tank is full. We recommend an Edson pump 278EB-40 diaphragm pump, The Edson pump that runs the sewage tank and is located completely under the center console. Also under the console are intake, and discharge pipes. Leaving the entire deck free to any trip hazards and much needed additional working space. The vent is located outside the starboard hull. 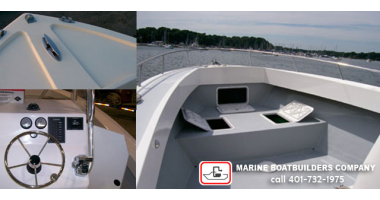 Stainless steel bow eye and transom tie-downs. (7) Ten inch S/S cleats. The cleat and chalks, as well as the running lights in the bow are pop up's. This is done for safety reasons it keeps the deck clear and free from scratching other boats. Two deep cycle series battries, with (1) non-feed back battery switch. Four stowage areas with lockable doors. Lockable door on center console. Seat in front of center console. Freeboards: 42" forward, 27" aft. 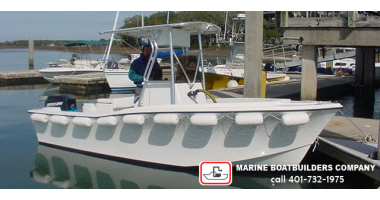 Marine BoatBuilders Company offers a five (5) year warranty on the hull and a (5) year warranty in the holding tank. This warranty applies as long as the boat is used as a Pumpout Boat only. 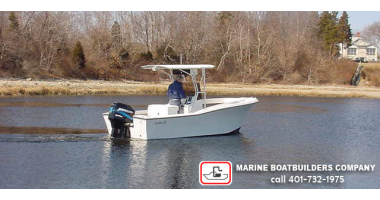 Call Marine Boat Builders today for a 19 Ft Pumpout Boat Quote at 401-732-1975 or complete our brief quote request form.